The daily band lineups have been announced for Rocklahoma, presented by Bud Light, May 25, 26 & 27, 2018 at "Catch the Fever" Festival Grounds in Pryor, Oklahoma, just outside Tulsa. Weekend and Single Day tickets are on sale now at Rocklahoma.com. 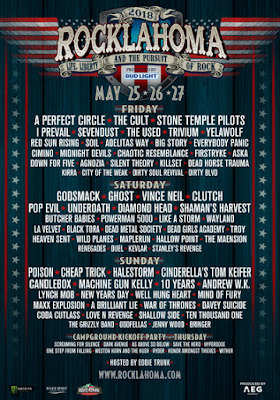 The 12th year of Rocklahoma, presented by Bud Light--America’s Biggest Memorial Day Weekend Party--will feature performances from a slew of top rock artists, including: Poison, A Perfect Circle, Godsmack, Cheap Trick, Ghost, The Cult, Halestorm, Vince Neil, Stone Temple Pilots, I Prevail, Clutch, The Used, Underoath, Machine Gun Kelly, Cinderella’s Tom Keifer and many more. The three-day camping festival features the best new rock artists and classic bands performing on four stages, with music going all night long. With onsite camping amenities and unparalleled VIP packages, Rocklahoma lives up to its motto of “Life, Liberty & the Pursuit of Rock.” In 2017, Rocklahoma had its biggest year ever, with over 75,000 in attendance. Registration for the Miss Rocklahoma competition is underway now at Rocklahoma.com. Voting on the Top 10 finalists begins in April and five finalists will compete on stage at Rocklahoma for the chance to be named Miss Rocklahoma 2018. Rocklahoma General Admission and VIP tickets (including layaway options), as well as Premier Packages, Hotel Packages and Camping options are on sale now at rocklahoma.com/tickets.html. Fans are encouraged to buy early and save. Each ticket price level has a limited number of tickets available, so attendees can save more by buying earlier. Ticket prices will automatically move to the next price level once a price allotment sells out. The layaway purchase option also allows fans to split the ticket cost into three monthly payments. Limited quantities of Groupie and Roadie VIP Packages are also still available. The Rockstar Package is SOLD OUT. Please visit rocklahoma.com/tickets.html for details. General Admission and VIP camping is also available at checkout, by calling (866) 310-2288, or emailing info@rocklahoma.com. The campgrounds are a unique part of the Rocklahoma experience, with an endless party running around the clock. The Rocklahoma campgrounds will be open from May 20 at Noon CDT through May 29 at Noon CDT. Festival doors open at 2:00 PM daily on May 25, 26 and 27. Note: Camping is only available with weekend ticket purchases. Rocklahoma is located just 45 minutes northeast of Tulsa, in Pryor, OK. The "Catch the Fever" Festival Grounds is a premier destination for a multi-day festival and includes onsite camping with access to restrooms and shower house, a general store for campers, VIP reserved seating, hospitality areas and much more.